I'm a day late with my Sunday Stamps post. Just another week and a half and I'll be back to working nights and no more crazy schedule interfering with my stamping time! This week at Sunday Stamps Joan has a great sketch for us! I'm in a Christmas mood(when am I not!) and so I pulled out a set I just got, Chock-Full of Cheer, to work with. I just love the mittens in this set so I decided to make those my main focal point. The DSP is out of the holiday catalog and is called Snow Festival, lots of great patterns in this one! I embossed the ovals with the Snow Burst EF to give them a little more pop and then sponged the edges with Soft Suede. Make sure you head over to the Sunday Stamps blog to check out all the other great projects from the rest of the design team and then why don't you play along with us? We'd love to see what you do with this sketch! 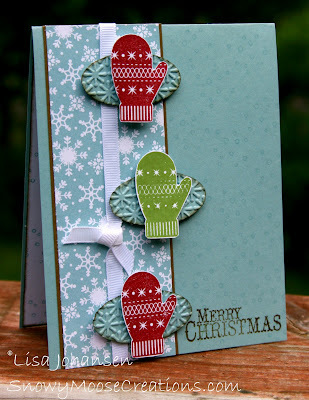 Love your card Lisa :) Great colour choices and the mittens are super cute! 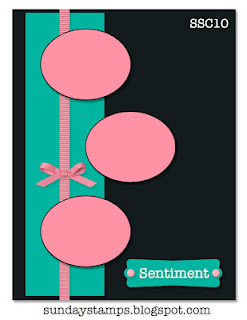 Sweet card: I like all the new Stampin Up product you have on it. This is so cute Lisa! Love those mittens!!! Yay - this is so much fun. I love how you turned the ovals on their sides and used them to mat the mittens...Fantastic! I love this card, the mittens are soooo cute!!! I love how you used them on this sketch, perfect. These pretty mittens are so pretty on the snowy, embossed ovals! What a perfect match!